Background: Pyrrolidine-based ring systems are ubiquitous in nature. (R)-Bgugaine is a 2-alkylated pyrrolidine alkaloid which has been isolated from the tubers of Arisarum vulgare, a toxic Araceae found along the Mediterranean coast. The construction of this heterocyclic ring system in an enantio-riched fashion has been the subject of attention in the recent years. This article covers the reports till 2016 on the isolation, biological activity studies and synthetic endeavours of bgugaine alkaloid. Method: The synthesis of (R)-Bgugaine was carried out. A structured search of Bgugaine was undertaken using bibliographic databases such as scifinder, scopus etc. The quality of the collected papers was evaluated using the impact factor (SCI) of journals in which the work was reported. The synthetic methodologies and chemical reactions from the screened papers were summarised wherein, the key reaction steps have been described in detail. Results: Thirty seven papers were summarized in the review to give snapshots of natural product i.e. bgugaine. The majority (20) articles focused on the introduction of the topic. These papers were published from different research groups working world-wide in the field of alkaloids chemistry. The general information about alkaloids, their medicinal uses, biological activity and structural elucidation comprises the highlights of this section. This demonstrates the importance of collaboration of experts working in multidisciplinary area to understand the topic in depth. Eight articles are corresponding to the synthetic protocol for construction of bgugaine via multistep synthesis. Remaining nine articles are citing the important reactions which are used as key steps for synthesis of bgugaine. 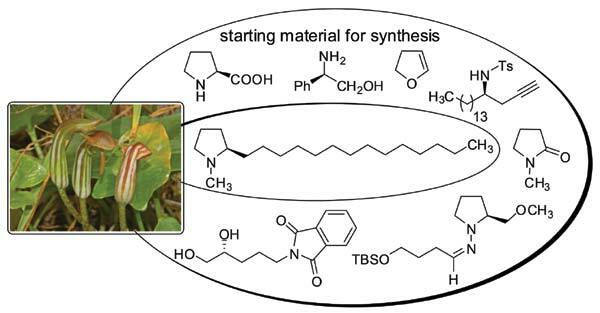 Overall, this review has identified the scope and significance of collaboration between synthetic, medicinal, biochemists and natural product chemists to identify bioactive compounds showing drug-like properties. Conclusion: The findings and content of this review give explicit information regarding the importance of deceptively simple pyrrolidine alkaloid skeleton, their natural occurrence, biological activities as well as synthetic methodologies. The advancement of new methodologies towards the construction of bgugaine could be useful for rapid identification of new biological leads. It shall certainly be of help to make further progress and develop new strategies for bgugaine core and related heterocycles, based on this literature report. Keywords: Alkaloids, bgugaine, bioactivity, natural products, synthesis. Keywords:Alkaloids, bgugaine, bioactivity, natural products, synthesis. Abstract:Background: Pyrrolidine-based ring systems are ubiquitous in nature. (R)-Bgugaine is a 2-alkylated pyrrolidine alkaloid which has been isolated from the tubers of Arisarum vulgare, a toxic Araceae found along the Mediterranean coast. The construction of this heterocyclic ring system in an enantio-riched fashion has been the subject of attention in the recent years. This article covers the reports till 2016 on the isolation, biological activity studies and synthetic endeavours of bgugaine alkaloid.